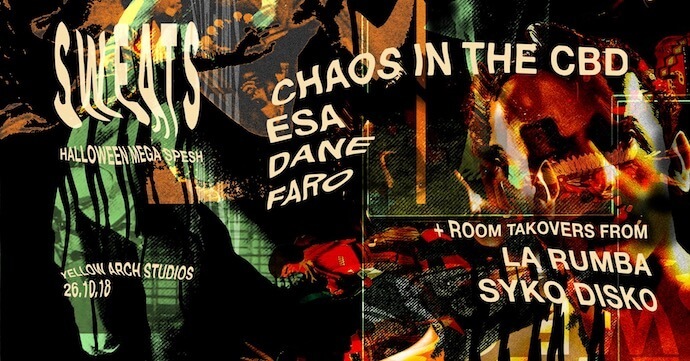 Disco and house night Sweats have announced their biggest event to date at Yellow Arch Studios this Halloween, with Chaos in the CBD, Esa and more. Sweats have been bringing decadent decor, incense, secret resident DJs and killer headliners to the Harley for over a year now, and expand to Yellow Arch for the first time this Friday 26th of October across 3 rooms. Headlining in room one are New Zealand’s deep and discoey brothers Chaos in the CBD, known for their party starting sets and Berlin based Dane, whose disco edits made waves in 2017. Room two sees La Rumba host South Africa’s Esa, known for his work with Ata Kak and his Dekmantel Boiler Room. The University of Sheffield Samba Band will be getting a party started in the courtyard, while DJ Faro and Tommy Farrow play b2b in room three. Tickets are available from £6 here.